Conveniently located right on the Vegas strip, Caesars Palace is a Las Vegas classic. Caesars Palace offers grandeur, fun, and a great escape from day to day life. Whether you are visiting Caesars Palace for the gaming, or staying there to enjoy the luxurious hotel, Caesars Palace will be a memorable part of your Vegas vacation. The casino at Caesars Palace offers a total gaming experience. In the 129,000 square feet of tables, slots and games, you’ll find everything from poker and keno to slot machines. Racing and sports betting is available, as are table games of all sorts. Low stakes gamblers will find penny and nickel slot machines to wile away a Vegas afternoon, while high rollers have access to a world renowned poker room, high stakes slots, and a wide variety of table games. If you enjoy the gaming experience at Caesars Palace, you may find the fun and splendor of the hotel at Caesars Palace ideal for your Vegas vacation. 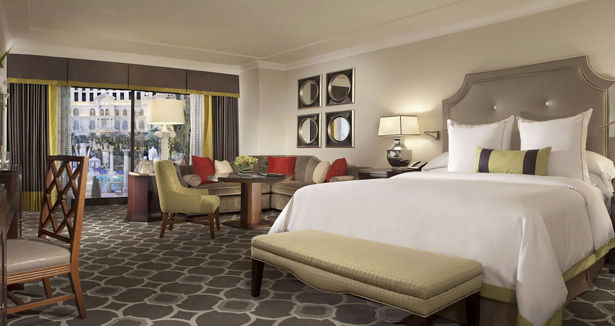 Whether you choose a traditional economical guest room at Caesars Palace or splurge on the elegance of a deluxe or premier guest room, you will find Caesars Palace a great home for your stay in Las Vegas. At all price levels, you will find the hotel at Caesars Palace a warm, welcoming, and fun filled experience. Caesars Palace boasts four beautiful sparkling pools with Roman style mosaics and poolside cabanas. A full service salon and spa provides you with any pampering services you might require. More than 120 shops offer everything from fine apparel to jewelry in Roman style grandeur. Caesars Palace is also home to several bars and nightclubs, featuring everything from traditional Vegas style entertainment to fun flair bartending. Fine restaurants offer a variety of cuisines in style and comfort. The 4000 seat Colosseum Theater brings a variety of famous entertainers to Vegas for shows of all types. From gambling to relaxing, from partying to playing, Caesars Palace offers the full Las Vegas vacation experience, combined with the glamour and style of the height of the Roman empire. Great vacation packages incorporating show tickets, spa time, or meal packages with your fine Caesars Palace hotel room are available. If you are planning a Vegas getaway, consider the height of Vegas grandeur at Caesars Palace.